A few weeks ago, my daughter’s 3rd grade teacher asked me to come to her class to speak about what it was like to grow up on a farm. They were in the midst of doing a history project to learn about something of valuable in their family. She felt that the kids would learn a thing or two hearing my stories as many kids have no idea about what it’s like to be farm kid. In my talks to kids, I really love engaging them and asking them questions to get them to participate in the talk. I really want them to think about how their childhood compares mine as it is starkly different. The first question I asked them was, “Who grew up on a farm?” Surprisingly, one girl raised her hand and said that she grew up for a short time in Waimanalo, which is also very rural. For the majority of the kids, none knew what it was like to grow up on the farm. I decided to expand on the stories of what I did as a kid on the farm. I decided to ask them what kinds of toys they had and where it came from. Most said they played video games or had something bought in a store that they loved to play with. I told them that the outdoors was my playground. We didn’t have a lot of money so we weren’t loaded with toys like the kids of today are. I did have a doll and a few items but not hoards of toys. The farm was my playground. I’d toss up stones, scour trees for bugs, pick fruits and jojo beans, catch butterflies, scoop fish, ride tractors and bulldozers, and play with mud. Some kids had done some of these things, but not many. I asked them if they ever made a toy. Most kids didn’t even think that they could make something to play with, other than Lego that is. I told them about how my dad was the expert recycler of what most people thought of as junk. He’d use an old tire and some rope and turn it into a swing for us. He would also use an inner tube from a tractor tire with a piece of plywood and turn it into a raft. Pieces of bamboo were used to make a bow and arrow that I’d shoot out in the field. Hand tools were also my toys as I could use them to make my own slingshots or other homemade gadgets from the “junks” or other stuff found outside. The wonderment in these kids’ eyes were amazing as they had never thought to do such things. Many kids also said that they loved to watch TV. I told them how TV was not a ritual for me and my siblings growing up. Saturdays were spent waking up way early and having your lovely sleep disrupted by a busy father. He’d turn on all the lights and pull off the covers to get us out of bed to get ready for the farm. We’d spend the day working on the farm with processing the papayas, planting, or cleaning the trees. I asked the kids if any had rode on a tractor before and a handful had through visits to the pumpkin patch. I shared the story about how my dad used the backhoe and graded the land and created a huge mountain of dirt. I asked if they knew what could be done with that dirt hill. One student figured it out and said, “Slide down it!” This magnificent dirt hill was a kids dream filled with soft dirt and small pebbles. My brother and I called it dog food mound and it was a daily ritual of climbing it and sliding down. Definitely a kid’s dream come true that these third graders were bubbling with excitement to hear of. I closed my talk by reminding them to talk story with their grandmas and grandpas. I told them that they probably have some terrific stories similar to mine that they should hear. Many of these kids haven’t sat down to learn about the stories of their family. They were inspired to now go and ask them about what kind of toys their grandparents played with and what was their playground. These kids were really excited during my sharing and even more excited to go out and hear of neat stories in their own family. By talking and sharing my stories, I’ve come to realize that the more we talk about what we do, the better other’s can appreciate it. The more we teach others and open minds to the wonders of the world and keep them curious, the more we have seekers of knowledge. We have to keep sharing our stories with the younger generations to know how and why we are so lucky to be able to do the things we can. I had to add in one last bit of hurrah to end it. I reminded them that they can do all the things in life because someone did a great thing by learning how to feed lots of people really well. That person was a farmer and I am lucky enough to have grown up a farmer’s daughter. For the past two years now, it seems that the barrage of anti-GMO sentiment would never end. In 2012, the farmers were hit with the GMO labeling bills and the Babes Against Biotech. Then again last year, the same sentiment continued yet again. Two whole years of fighting and speaking out for your family farm and biotechnology can get exhausting. There is always something to fight against and after awhile, it gets really tiring having to defend yourself. I was just lamenting to a fellow farming agvocate the other day about getting weary from all of this. I thought I’d take a break from blogging to give my mind some rest. I felt as if I had run out of ideas and thoughts already. Taking a hiatus was what I thought I’d do last night that is. Early this morning, before the sun was even up, my brother Mike and I went down to the State Capitol for the Eat a Papaya Day. 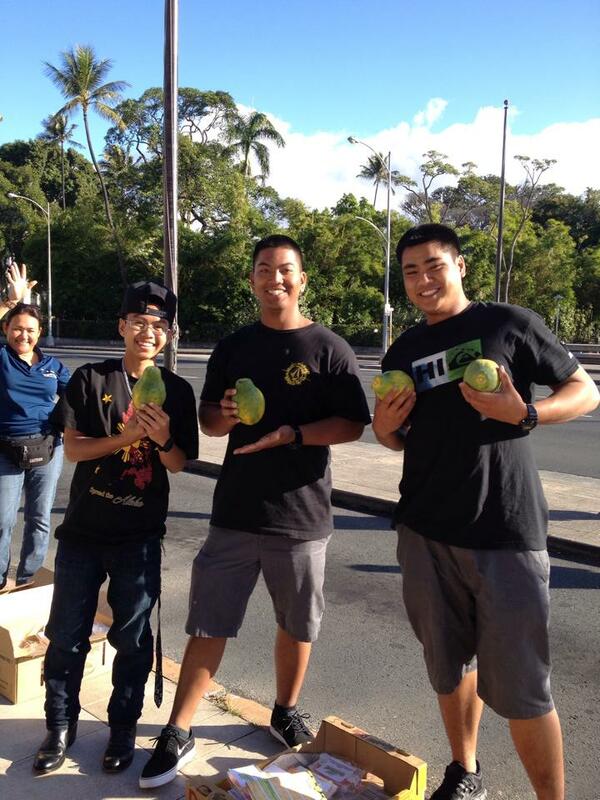 We packed up freshly ripened fruit and other supplies to help advocate for the papaya farmers across our island. We had our signs made that showed the drivers what our event was about and had lots of samples to hand out to pedestrians and drivers. 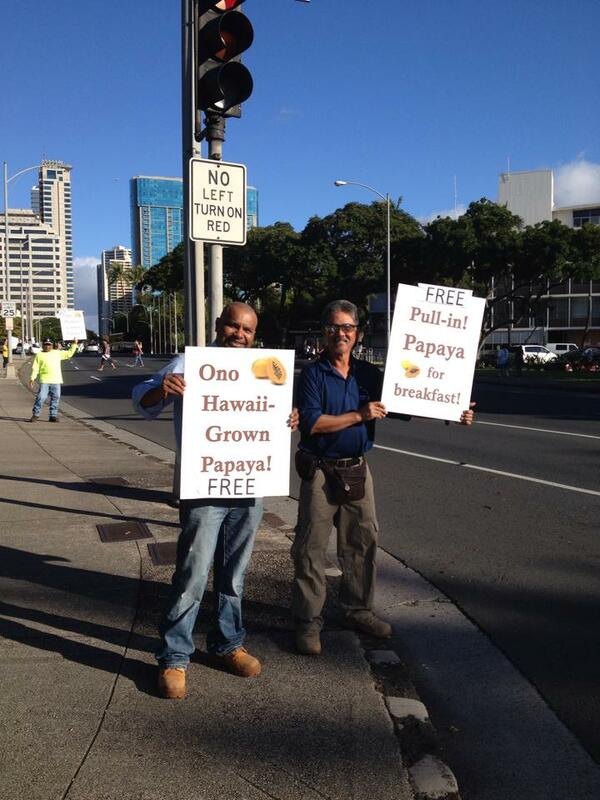 We had papaya farmers from the Big Island join us as well as other biotech farmers alongside. 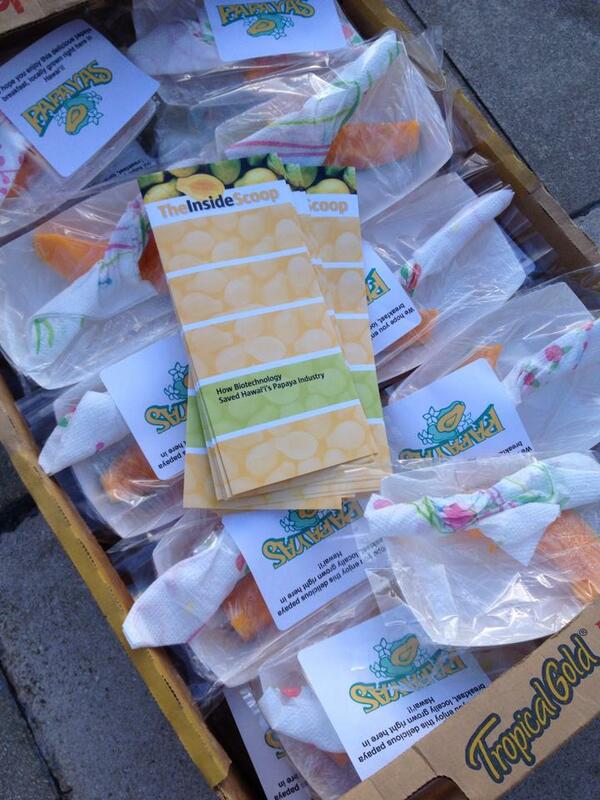 We handed out some 400 samples this morning along with whole papayas that were donated by the farmers. We were really well received by the majority of people who were really thankful and excited to “Try a Papaya.” How many times can get some a free papaya handed to you?! 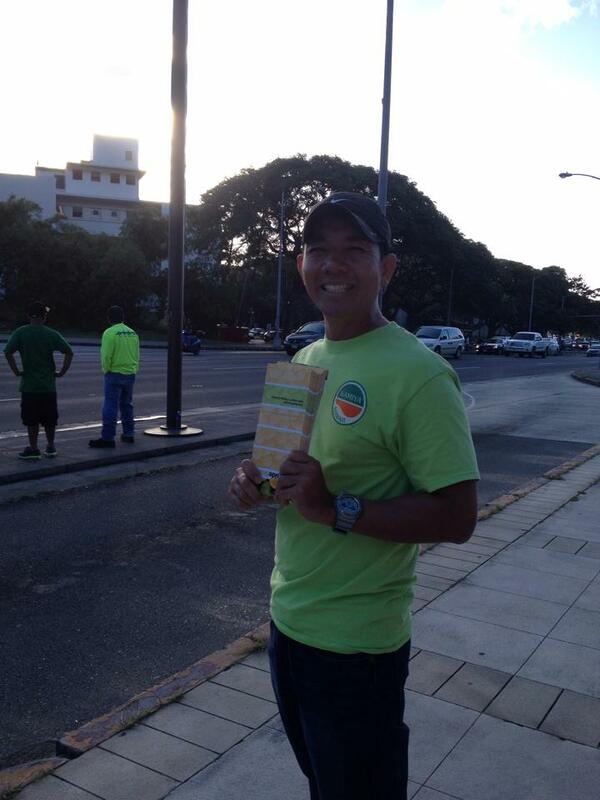 Shortly after our campaigning with the public on Beretania Street ended, we were treated to even more help. 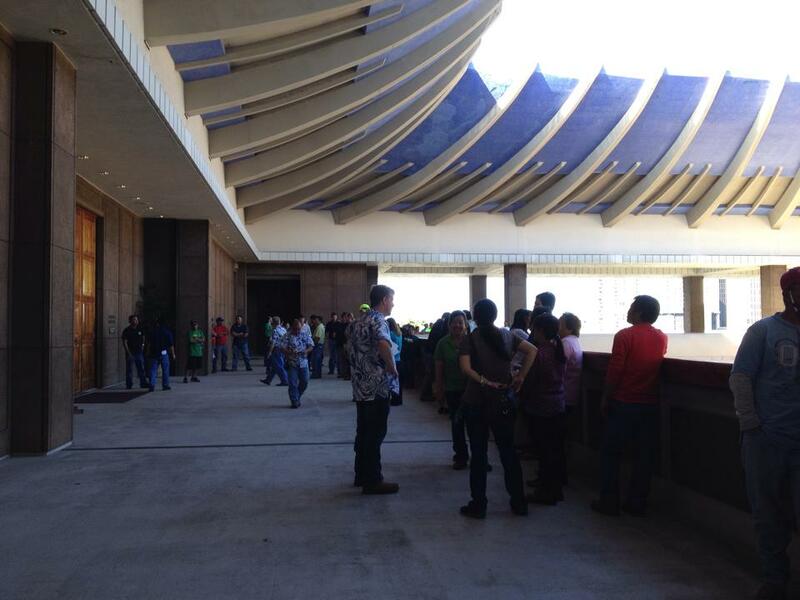 More biotech farmers joined along with the papaya farmers and we walked the floors of the Capitol and visited legislators. Seeing all of the people around us that shared the bond of biotechnology and talking to many of them, it reinvigorated me even more to continue to speak out. It was just what I needed today to continue to speak out for this technology that helped save our farm and others. So many people, including legislators, got to hear the story about how biotechnology saved our farm. I also met many people that I only know online today that have read my thoughts here. It’s amazing to know that people are hearing the farmers out like ours. I’ve really come to realize that so many people are also linked to the papayas through our common bond of biotechnology. The common bond is that we are all people and that we are using a technology to help people from farmers to the consumers who appreciate our products. This is something that several of our Hawaii legislators will never confess to but willingly do it. These politicians are quick to criticize GMOs and state that we must use the precautionary principle to protect the public from dangers. They will give their “expertise” on GMOs even though they have no clue as to the changes of technology and the testing of it. They will tell the public over and over that you have to buy GMO free if you want better health. They will fight the seed companies and state that the counties need to have home rule for governing over the creators of these GMOs that eventually become food products. They even play traditional Hawaiian games with Walter Ritte and photograph themselves doing so with smartphones and use the high tech social media to spread it. They will then claim that it’s the public’s right to know what they are eating when really, it only helps a certain industry and increases profits in their side businesses. The bottom line is that these politicians want the public to know is that they are in danger of these GMOs that we are consuming. The public must believe them and fight the evil cause. All the meanwhile, these same politicians go out to other’s fundraisers and happily consume these GMOs without and question of what they are eating and drinking. The liquor they drank and the dim sum they ate were far from being organic, but they still ate. They are alive without a single issue after years of fundraisers and free food and drink even though they will tell constituents otherwise. Those two anti-GMO politicians tonight were Senator Russell Ruderman and Representative Kaniela Ing at the Freshman Fundraiser at the GMO serving restaurant, The Mandalay. These two were consuming foods derived from the products of biotechnology that they are fiercely criticizing yet willingly consume without a label. I sure hope that deep inside, Senator Ruderman and Representative Ing thank those conventional and biotech farmers who grew the food they consumed tonight! It really looked like you enjoyed consuming it without any worry or care. Imagine the streets bustling with excited protesters. Imagine their placards: anti-GMO, anti-wifi, anti-vaccine, anti-western-medicine. A collection of sentiments that is tied together by a common ethic: a sense that modernity poses a looming threat, that science and progress has run amok, and that humanity is on the verge of great calamity, disaster even, if we do not stop progress dead in its tracks, reexamine the foundational assumptions that underly our understanding of the world, and apply an extreme caution to any further exploration or development. Amongst that diverse assembly of humanity, earnestly waving their placards in defence of Mother Nature against the callous onslaught of modernization, how many of them would not exist today if not for the very same technologically driven advancement which they bemoan? How many would have never been born if their parents or grandparents had succumb to any of the many deadly childhood diseases which have now been eradicated by vaccines? One in six? How many would not exist today without their grandparents who emigrated from the developing world, having been among the one billion humans who survived famine due to the agricultural advancements of the 50s and 60s? One in seven? How many are alive today because of insulin, produced by genetically engineered bacteria? Or how many survived infections, historically fatal, with a simple dose of antibiotics? One in every five? How many of them rely on wireless communication technologies to get their anti-technology news? To share that information? To organize their rallies? How many would have missed the event without smart phones, cell towers, and free wifi at Starbucks? I find it ironic to think how sparse the crowds would be. How few placards would be seen. How few anti-modernity protesters would exist, we’re it not for the very products of modernization which they despise. We stand at the edge of the warm sunrise of the springtime of our civilization. Stand aside please. Don’t block my sun. Joan Conrow made a great point in her most recent blog post the other day when she asked the question of why we are not growing more food. What’s missing are farmers. Though many love the rhetoric associated with farming, fewer are willing to embrace it as a livelihood. She goes on to point out that farming seems very idyllic but that there is harsher reality with actually living it. Some people who farm are able to do it because of other streams of income, while for others it is their sole source of income. When most people think of farming, they get the impression that it is getting your hands in the land and growing something. Farming is much more than that indeed. A farmer is not only a steward of the land, but also a business person. In order to make it a livelihood, he needs labor which means hiring people and taking care of them. The farmer has to take care of labor law compliance, benefits, workmans’ compensation, safety laws, payroll management, and knowing the tax laws also. The farmer also has to be a mechanic and heavy machine operator. Some one has to teach the hired help how to drive and fix the tractors and how to get them around the field safely to harvest fruit. Not only does the farmer have to take care of business and run the equipment, he also has to have a good knowledge of pests and diseases, so that his crop won’t be lost. He teaches his workers how to recognize and care for the crops and when to take care of pests. Another duty that a farmer has to do is take care of his customers and follow up to be sure that his product is up to par. He spends his time talking with customers to make sure that they are happy with his produce. It’s about building and maintaining relationships and partnerships to support each other. Joan really hit the nail on the head with her blog post. As much as Hawaii wants to have a sustainable food supply, we can’t if no one wants to actually do it. It’s easy to sit back and want to have more local products and local foods but if no one is going to actually do it, it won’t happen. We’ve got to support the farmers now so that the future is brighter for the next generation to pursue it. If our leaders truly want to walk the talk, they’d be looking out for what’s in the best interest to preserved farming and the farmers. Stop with adding a “home rule” burden and take a look at what really needs to happen. I am always interested in learning more about the role of biotechnology in the world and had a great privilege to get a blog post from a Monsanto Multi-System Program Lead, Mark Wood. Read on and learn about Hawaii’s role in feeding the world. There are many urban myths about the company I work for, and I encourage folks to please take the time to learn who we really are and what we really do, so they can separate fact from fiction. What I’d like to do in this guest blog is share with you why I willingly choose to work for Monsanto and why the work I do matters so much to me personally. The feel of dirt under your fingers and a pride knowing you planted that crop keeps me coming to work everyday. Where I grew up in Western Oklahoma, the dirt is red – as red as we have here in Hawaii – and farmers had to survive on 14 inches of rain a year. There were shelter belts to protect dry soil from being blown away, and dust bowls were a real concern. Over the years, I began to see how much impact one inch of water can have on a crop for feed, food and ultimately, a livelihood. I developed a passion for conservational tillage and what farmers can do to conserve soil and be more sustainable. Prior to joining Monsanto, I served as an assistant professor at Oklahoma State University, where I focused on evaluating new herbicides, irrigation systems and ways to conserve soil in a state that needs to conserve every inch of water and soil it can. When I was given an opportunity to work for Monsanto, I was also given an opportunity to make a real difference in the place where I lived and eventually, globally. I joined the company because Monsanto focused on sustainable production and is as passionate about agriculture as I am. It allowed me to research sustainable farming practices, and to help farmers. At Monsanto, I focused on improving dryland yields by combining our genetics research with strip-till and no-till cropping systems. It was rewarding work. I partnered with universities, other seed companies and farmers to collaborate on how we could conserve more and produce more. In 2004, I transferred to another part of our business that focused on developing the drought trait. This research team was working to develop improved varieties of corn that were better able to tolerate drought conditions. What an exciting benefit it would be for farmers in places like where I grew up. As I visited other countries, I quickly realized the tremendous potential this trait could have for farmers in many places. 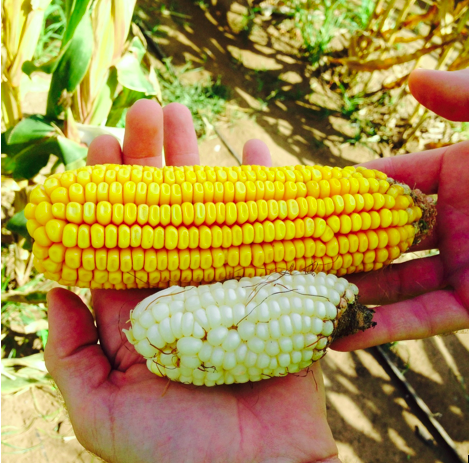 Like all biotech traits, this drought trait has traveled a long road to get to market. It has taken almost 12 years to get to where we are today, at a cost of almost $150 million. Why is the cost worth mentioning? The fact that it takes 12 years and $150 million to launch a product underscores the amount of time it takes to research, develop and undergo the regulatory process required to make that trait available to the farmers who want it. By comparison, conventional (non-biotech) products undergo less regulatory scrutiny and can be brought to market in about two-thirds the time. In 2011, I moved to Hawaii and currently oversee our Multi-Season Program, which supports our corn breeding nurseries. During one of my nursery tours, I took a picture and posted it, highlighting the value of Hybrid Production vs. Open Pollinated corn production. The advantage of corn hybrids is that they yield more and use fewer resources, and the end result is we can feed more. The large ear of corn in this photo is a hybrid. The one on the bottom is from a maize variety relevant to Africa. 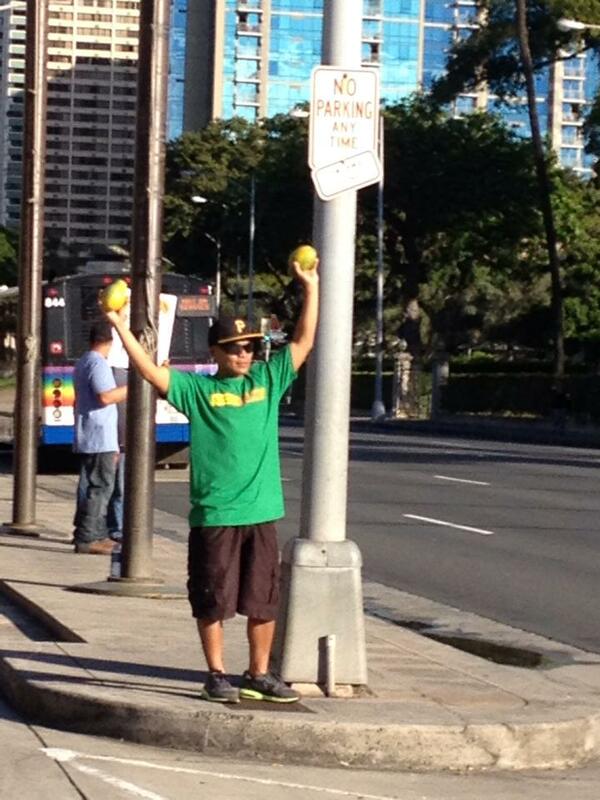 So what does this have to do with our work in Hawaii? Monsanto is working with other key stakeholders to launch a project called Water Efficient Maize for Africa (WEMA). Africa has experience severe droughts over the past 10 years – a severe problem when you’re trying to grow enough food to feed millions. The WEMA project seeks to help farmers in Africa address some of these challenges. Monsanto’s contributions include providing maize germplasm (genetic materials of a plant, such as seeds) to help the plant breeding efforts, offering technical expertise to develop and deploy locally adapted maize hybrids, and donating our commercial drought-tolerance and insect-protection traits royalty-free. Some of this very important work is being carried out at our nurseries in Hawaii. 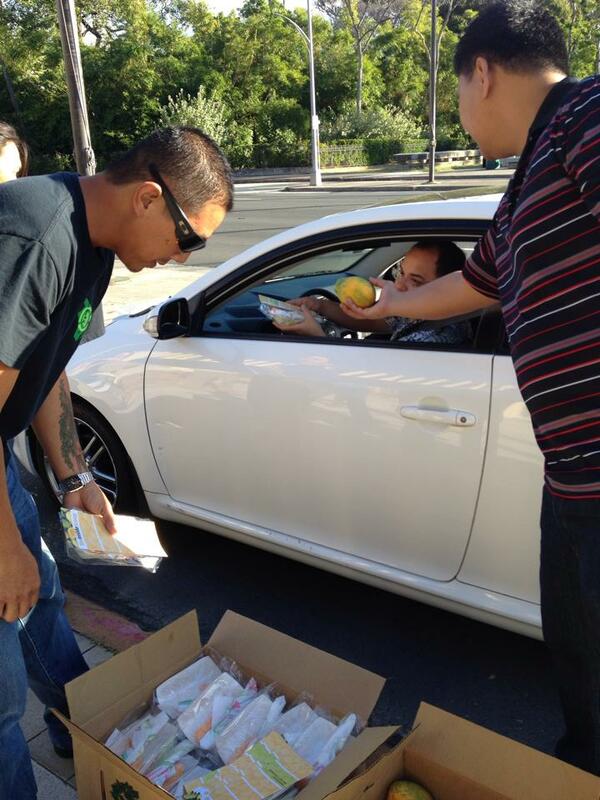 We would not be able to do this important humanitarian work if there were bans on GMOs. There are many myths about Monsanto in Hawaii, but this is something that is real and that everyone Hawaii can feel proud of. Supporting biotechnology means supporting a beneficial technology that helps to feed you and helps to feed people in places where one meal a day is sometimes a luxury. We operate our nurseries in Hawaii with three goals in mind: produce more, conserve more and improve the lives of others. I am proud to be a part of a company that allows me the freedom to focus on sustainable production, partner with great organizations that help others, and give back to the communities where we live and work. We are always open for dialogue. All we ask for is an open mind that separates fact from fiction. Check us out at MonsantoHawaii.com, look us up on Facebook at Monsanto Hawaii and/or follow us on Twitter, @MonsantoHawaii.